In this review we will take look at the Cuisinart DBM-8 Supreme Grind Automatic Burr Mill, to see how it stacks up for the discerning coffee lover. This grinder is one of our top picks as seen in our coffee grinder reviews. The DBM-8 is an automatic coffee grinder, but you’ll find out why that’s a bit misleading and what to expect when using this burr grinder. It has a hopper with a lid on the top, where you put the beans and another hopper that catches the final ground product. Both of these hoppers are removable. The bean hopper holds 8 ounces of beans, has a lid, and also includes a scoop and a cleaning brush. The grind chamber that catches the freshly ground coffee holds enough ground coffee for 32 cups. 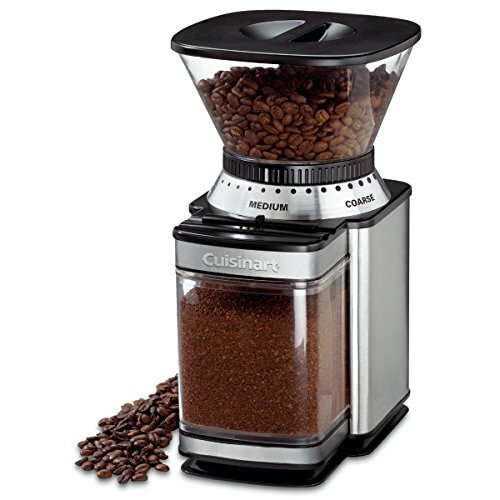 To use the Cuisinart DBM-8, you place the beans in the top hopper. You then adjust how much coffee per cup simply by sliding a lever. You can adjust the amount of grounds required from 4 to 18 cups. Press the one-touch power bar to start it, and it will grind exactly the amount you need, without the need to measure your grounds once complete. You will have to do some experimenting to see how many cups of grounds you like to use in your coffee maker for your desired amount of coffee. You also easily adjust the grind size by twisting the hopper. This is an 18-position grind selector, from ultra-fine (for espresso, for instance) through medium grinds to extra coarse (for French press, for instance). Each of the three choices – fine, medium and coarse – has six settings. The sliding lever that adjusts the quantity of grounds and the easy-turn grinder setting will definitely make this grinder easy to use. Once the grinder is finished grinding your beans, it automatically shuts off to let you know it’s done. The heavy-duty motor grinds the beans into the chamber, and then you’re ready to make coffee. You can also store extra grounds in the bottom chamber if you make more than you need. SEE ALSO: The best way to store coffee! The DBM-8 has brushed stainless steel housing and also features cord storage in the back, for easy storage in your cupboard or on your countertop. It stands about 11 inches high. The grinder comes complete with all you need to grind coffee, which are the two hoppers and the machine itself. The only accessories included with this grinder are the cleaning brush and the scoop. You can use the scoop to load the beans or to get the coffee grounds out of the bottom chamber once the grinding is complete. The brush is for cleaning the unit, particularly the grinding mechanism and the bottom chamber that catches the grounds. An optional accessory that may be desired is a general cleaning brush. You may find that a specially made cleaning brush will be a handy accessory to add to your kitchen as it will make the cleaning process easier. Another possible accessory is a coffee holder, or vault, that seals tightly when closed. This would be better than the hopper for storing extra grounds for longer periods of time. The easy-to-use settings are a plus on this grinder. It’s great to be able to simply plunk in your beans and slide the setting to the desired number of cups required. The machine stops when it gets to the amount you need. We also love the grind settings, which allow you to choose six settings each within the categories of fine, medium and coarse. The grinder then produces a uniform coffee grind size. One drawback to the grinder is the mess that the grinds can cause. There is coffee “dust” created when you grind, although the design of the bottom hopper does minimize that to a great extent. It’s also important to take the grinder apart once in a while and give it a good clean, to remove any of the grounds, coffee dust and possibly chunks of coffee that can get trapped in the grinding mechanism and the hoppers. Another possible frustration is figuring out the quantity of coffee grounds you need for your coffee maker. While it’s easy to choose the number of cups for the machine to grind, it may not be exactly the flavor you desire. The machine’s setting for four cups, for instance, may not be strong enough for your tastes. But with a little trial and error, it should be easy enough for you to figure out your preferred setting. Who Is The DBM-8 For? This grinder is ideal for the discerning coffee drinker who wants the best cup of coffee, one made with fresh ground beans. This grinder will be easy to use and relatively easy to clean. It also has enough coarseness adjustments to allow you to use it in a variety of coffee makers, from the best French presses to espresso makers. The DBM-8 will provide you with a quality burr grinding experience at a relatively low cost. It’s also attractive enough to stand on your countertop next to your coffee maker. Remember that grinding coffee is loud, so if you have a late sleeper in your house, you may not be popular in switching to fresh ground beans! This is also not the product for someone who values convenience over fresh-ground. If you just want to get making coffee, it’s probably best that you buy ground coffee and skip the home grinding process. 1. Is this a conical burr grinder? No, this is a disc or flat plate burr grinder. 2. Can this be used as a grain mill or for other grinding uses? Yes, you could use this to grind grain, pepper or other items. The only consideration is that, just like your travel mug, once you have put coffee through it, it will probably retain the taste and odor of coffee. 3. What is the minimum amount of coffee that can be ground? The minimum setting is for 4 cups, and the maximum is 18 cups. 4. What are the settings for the texture of the coffee? This grinder has 18 coarseness settings. It has three categories –fine, medium and coarse – and each category has six settings. This allows you to grind beans anywhere from extra fine, for an espresso maker, to extra coarse, for a French press. 5. Does this make a mess after grinding? It can be a bit messy, or “dusty,” from the ground coffee. If you remove the hopper with the lid intact and pour the coffee through the hole in the lid, it should minimize the mess from coffee dust. 6. What’s the wattage of the motor? 7. Are there different color selections for this grinder? No, this grinder has brushed stainless steel housing, with plastic hoppers that are BPA free. 8. What happens if I grind too much coffee? You can use the bottom hopper to store any leftover grounds that you have, for the next time you make coffee. The only downside of that is that your coffee won’t be fresh-ground. With some trial and error, you will be able to determine which setting is best to create the amount of coffee you need for your coffee maker. There isn’t much on this grinder that could be improved. For some people, it might be preferable to eliminate the number of cups settings, and just pour in beans and grind however much coffee you want. If that’s desired, however, you can just set it to the maximum number of cups, which is 18 and grind to your heart’s content. If someone is very fussy about having everything properly aligned in the kitchen, they may not like the fact that the grinder looks off kilter when the coarseness setting is in some positions. That’s because the bean hopper is square at the top, so when you twist it to adjust the coarseness of the grinds, it can look crooked. Those are fairly minor issues with what is a decent kitchen appliance. The coffee drinker who wants to grind beans at home will appreciate this easy-to-use grinder. With just a few adjustments to the settings, you will be able to grind beans, extracting the oils and aroma to create a great flavor and the freshest cup of coffee with the Cuisinart DBM-8. This grinder functions well, is easy to use, looks great on your countertop and is easy to tuck away in the cupboard if you desire. With some trial and error on the settings, you will be able to get the amount of grounds you want, at the coarseness you desire, and enjoy your morning java with only one additional, easy step.